Ep 19. Small Business Big Marketing. How to grow your business using these top marketing hacks, with Tim Reid. 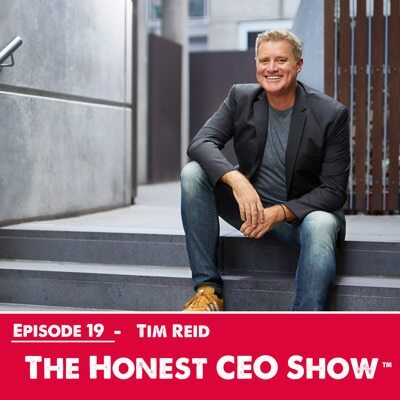 My guest today Tim Reid is founder and host of Australia and New Zealand’s number one business and marketing podcast - The Small Business Big Marketing Show, which can also be found on all Virgin Australia domestic and international flights. Having launched his hit program seven years ago and with well over 300 episodes under his belt, it regularly ranks on iTunes above the Australian Stock Exchange, Alan Jones, Tim Ferris and even outranks Harvard Business School as the number one business marketing podcast. Tim has built a global audience of motivated business owners in 110 countries, and is also the author of The Boomerang Effect, a popular marketing text. Prior to this, he was the marketing manager for Flight Centre and spent ten years working in Australia’s largest advertising agency looking after the advertising needs of Gillette, AXA, Yellow Pages and Dulux. Tim was also instrumental in helping AFL legend Jim Stynes raise one million dollars for his youth charity, Reach. Tim travels the world (having spoken at 63 conferences in eight countries in the past 12-months) showing business owners and marketers how to embrace modern marketing methods – gaining success and increasing profits, without spending a fortune. He believes there’s never been a better time to market anything. Ever! Tim's tips for starting a podcast show. The benefits Tim sees from building his personal brand. His tips for creating a personal brand. Tim talks about how to use outsourcing as a resource for better time management. Tim provides an overview of the key low cost areas business owners can focus on to leverage content marketing to generate leads. Tim talks about his book the Boomerang Effect. Tim shares the biggest lessons he learnt in business. He provides advice for anyone struggling in business. Sit back, listen, and I hope you take home one or two of Tim's wonderful pearls of wisdom.